Jazz at Bainbridge Island BBQ. The list below represents my informal, but thorough polling of friends on the island, with kids. We know pretty much every kid likes McDonald’s, but this list represents restaurants that serve food grown-ups like, but caters to kids as well. Either with a kid’s menu or they are friendly and willing to work with you on dishes for your pickly lil’ eaters. 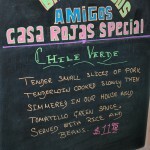 Most of these restaurants are outside the tourist zone and cater well to the year-round local customers. You can click on the heading/title of each restaurant and it will route you to the restaurant’s web page for hours, directions, menus and specials. 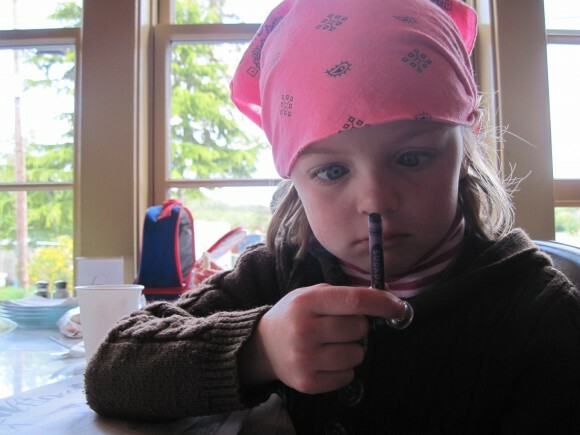 Crayon cleverness at Treehouse Cafe on Bainbridge Island. 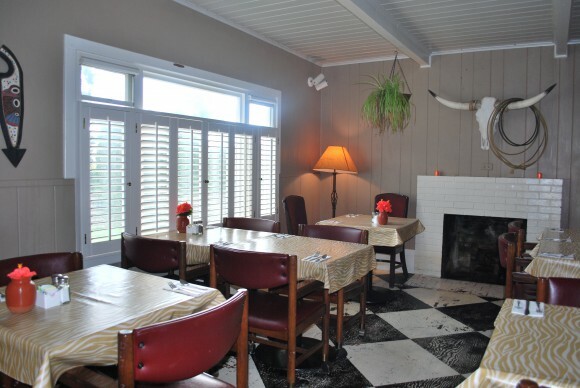 The expanded dining area at Treehouse Cafe. The patio in winter mode at Doc’s Marina Grill. 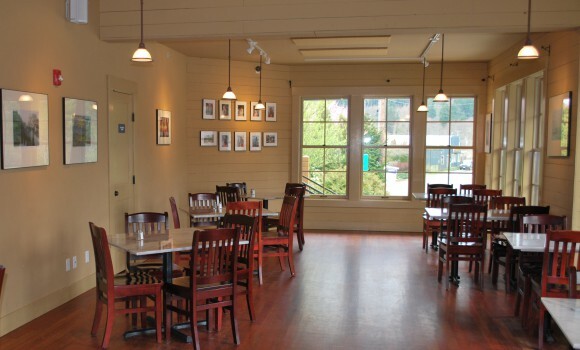 One of the dining rooms at Bainbridge Island BBQ. If you can throw your peanut shells on the floor, you know you are ok to bring your toddler to this restaurant. BI BBQ gives you a basket of warm peanuts (in the shell) when you sit down. Peanut cracking is a very fun and addictive activity to pass the time while you wait for your food. 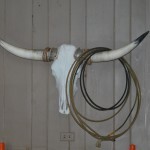 They have a clever western motif, plus a TV and free wi-fi too. The owner’s child, Jazz, is usually there too . . . another sign of a very kid friendly spot. They have a kid’s menu to color and are so nice about making something your child will eat. 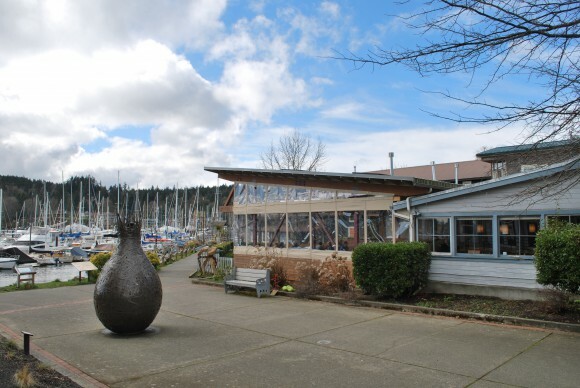 $$ Updated 4/2013 – Their restaurant on Winslow Way is now closed. Find BI BBQ on Saturdays at the Farmer’s Market on Bainbridge or at the Strawberry Park Snack Shack (5-8pm M-Th) for the 2013 Softball Season thru June. Also available for special events. Stay tuned for their new delivery menu for delivery on Bainbridge. 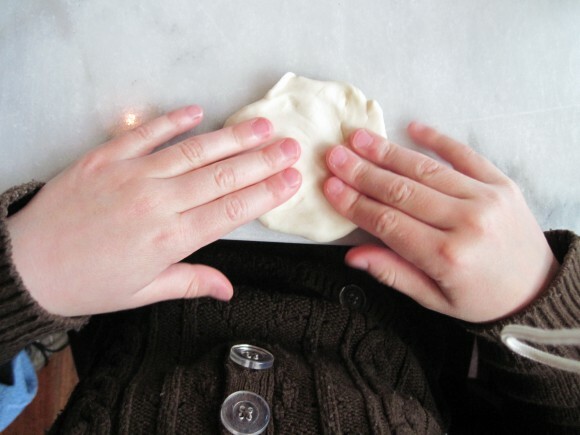 Such a little thing like pizza dough, can offer so much sanity during your meal. Dough fun at Treehouse Cafe on Bainbridge Island. 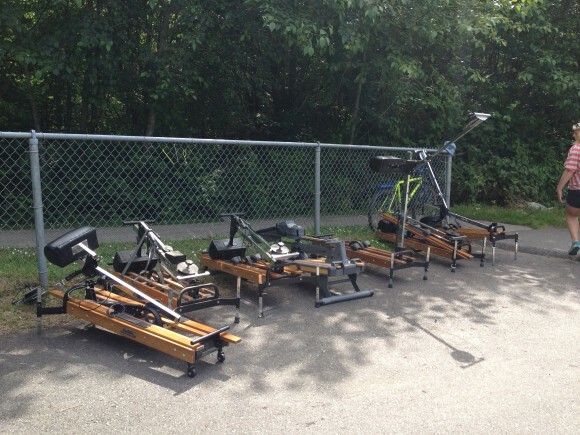 Bainbridge Island Rotary Auction and Rummage Sale happens Saturday, June 30th. Yesterday I finally made it to Rotary. Yes, I have been as a shopper, but never as a volunteer. This year marks my 6th Rotary Auction ‘experience.’ And since we moved here I have wanted to spend the entire week prior to the actual sale volunteering. I have had visions of spending the entire week helping to organize, clean and prepare for the massive rummage sale. The sale is so massive it does take an entire village. A village of volunteers to make the amazing day happen. But each year things like work, kids to watch, and visiting family to entertain, have kept me from committing to the full preparation week. But, this year I found out you can drop in a day here, a day there and volunteer. I could totally do that. And I did. Our entire family did, actually. We spent yesterday afternoon spread out over three departments doing a little community service. The Book Room at the Rotary Auction on Bainbridge Island. I spent my afternoon shift in the Book Room, which is actually the schools gymnasium. Lover of books that I am, and since since I hold a literature degree, I thought I would make some good use of it. The room in and of itself is quite a site. The variety of genres is beyond extensive. From medical text books to leather bound classic books, every year there is a surprise gem and also of lot of books that aren’t really even books at all. Like the manual for your printer. Not really a book, right? But the dedicated volunteers dust, sort, lift and walk. Walk a lot. One of the volunteers I worked with wore a pedometer the day before and walked eight miles distributing books to their sections. 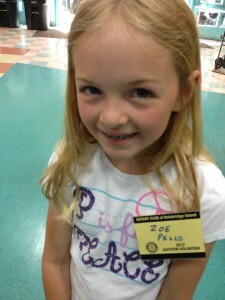 Rotary Auction Volunteers – young and old welcome. My husband and our youngest daughter sorted and cleaned golf clubs. There are A LOT of golf clubs – all sizes. They got to spend the afternoon in the sunshine and since they were outside they also got to watch the cars line up and unload. The skis are also really piling up. They can not even display them all, so if you have an idea of how to repurpose them by building a small house or something out of them, stop by. The couches are piling up too, as is the exercise equipment. The Nordic Track count was only at seven as of yesterday, and I bet it will end up close to 30 by auction day. I think the Nordic Tracks should be tagged, like wild life, and then we can keep tabs on which ones return to the “nest” each year. I think at least 70% of these circle back after they have done their time as clothes racks. My oldest daughter and her friend roamed around a bit, polished furniture, tested out sport equipment and sorted clothing. It is a bit of a social scene for the tween crowd. As it is for all ages. There are many volunteers and Rotary Members who faithfully volunteer year after year and do so the majority of the week. The Rotary Sale builds a community village that works together, talks, laughs (the phrase “did you see this” is heard a lot), strategizes, and even shares meals together. They ring a dinner bell for the evening meal and all volunteers gather and share dinner in the auditorium at Woodward Middle School where the entire event takes place. This is just one way Rotary thanks its volunteers. Crews also walk around with snacks, ice cream and water throughout the day too to keep volunteers fed/hydrated and happy. 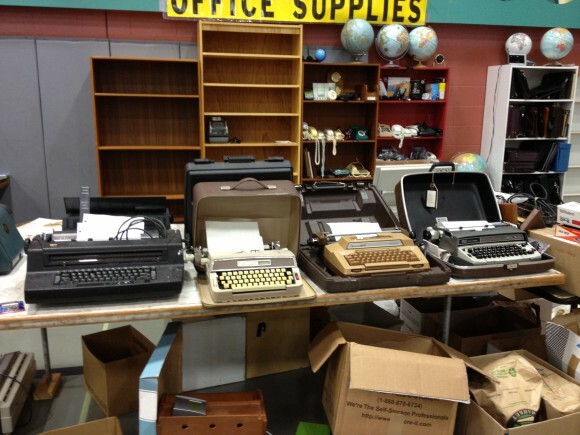 One perk of volunteering is you can scope out the selection of typewriters. After working eight hours you also get some pre-shopping perks. But really, you can tell just from being there a few hours that those perks are not at all what it is about for the community who spends the better part of their week shaping the sale. Creating the ‘village’ and being a part of a large force, something bigger than yourself, is really what it is all about. The hundreds of volunteers successfully turn an empty six acre school campus into a one day rummage sale with 33 departments (see map here) that grossed over $366k dollars last year. And that money goes towards scholarships and funding projects both locally and internationally. Have a few extra hours this week? Head over to Woodward and experience the Rotary Community Village for yourself. I’ll see you there. To volunteer, check the site here or just head over to the Volunteer Desk in the Commons Area at Woodward to sign up and check in. Nordick Track count at Bainbridge Island Rotary Auction mid-week at a measly seven. Late summer nights at Lytle Beach. 10. The sun shines a lot and the days are long. Like light until 10pm long . 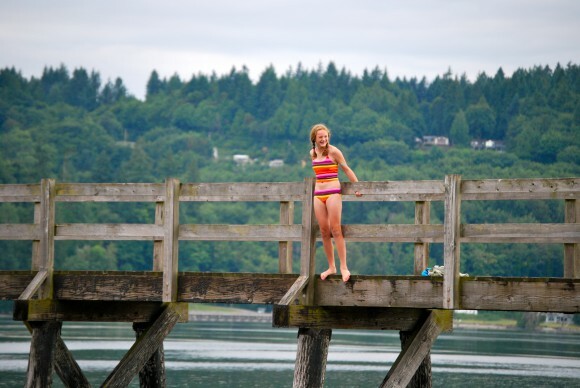 . .
Pier jumping off of Point White Pier . . . at high tide. 9. Pier jumping out at Point White Pier . 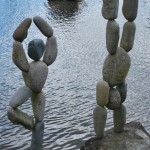 . . watching my kids do this, that is. 8. Having bonfires on the beach, or in the backyard, with friends. Day trip to Gasworks Park in Seattle. 7. Being able to ferry over to Seattle for the entire day. 6. Enjoying toast and jam outside at Blackbird Bakery. 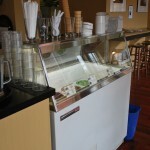 Mora Iced Creamery on Bainbridge Island. 5. Mora Ice Cream in the evening. 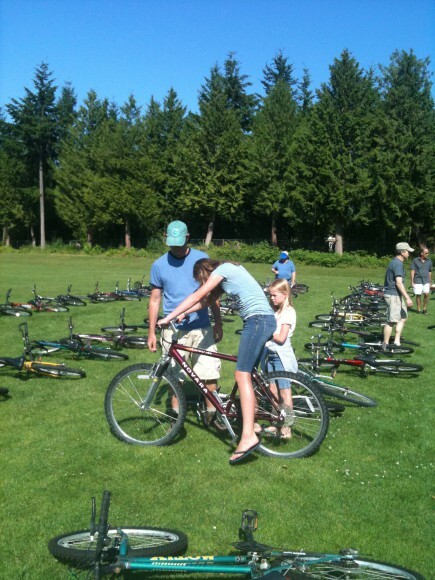 The sea of bikes at the Bainbridge Island Rotary Auction. We dropped one off yesterday. 4. 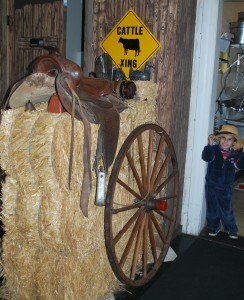 The Annual Rotary Rummage Sale & Auction. Drop off started yesterday, the sale is Saturday, June 30th, 2012. 3. Saturday mornings at Farmer’s Market. The best place to get salad greens (and pot stickers) on the island. 2. Cool runs in the shady Grand Forest. Or a sunny run along the water out at Fort Ward Park. The Grade Ol’e 4th of July Parade on Bainbridge Island. 1. The 4th of July Parade Bonanza downtown. The view from here. The backdrop for my run. Mt. 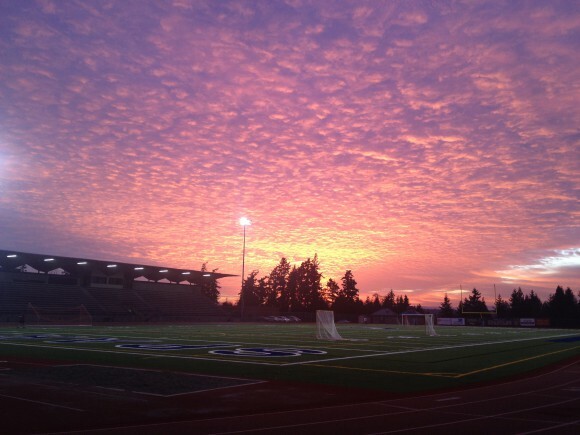 Rainier, the Seattle Skyline and Olympic Mountains are also visible from the good ole' Bainbridge High School. I wish I could compose blog posts while I run. Well, I can compose them, I just can not get them out of my head and into cyber space without sitting down and typing. Spring was nuts in my real estate world. Add in several volunteer projects, a gazillion school reports, field trips, softball games (LOTS of softball games), end of school year parties, and my time evaporated. As did my blog posts. But, through all the busy times, I did manage to squeeze in my runs. Sometimes they were two miles instead of four, but I have found they are a necessary outlet for so many reasons. If I could just blog/run. The last day of school, annual after school party at Lytle Beach with friends. Now, school is out and we are all finding a new routine called summer. My older daughter plays Allstars for softball, so that keeps us here until mid-July. Many people head off island in June. Because, yes we have what is infamously called June-Gloom or Junuary. Ugh. I DO dislike gray and rain in June. Many California natives bolt in June and head south, but a solid number of us remain and piece together the gray and the sun to make the most of the weather. We have just come off of a string of three sunny and warm days, but alas we are headed for rain this weekend. What will we do? Head to the indoor pool or the library. 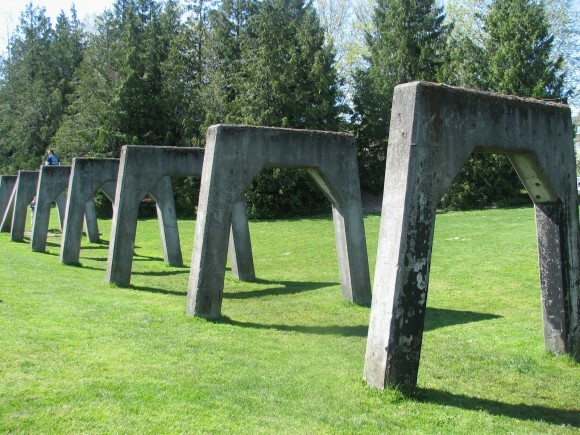 Explore Seattle museums. It is still warm, just not sunny. But on SUNNY days like today, we get out and go to the beach. My younger daughter spent the day at Fay Bainbridge with friends and all of us spent the evening at Strawberry Ball Fields playing softball and having dinner with my daughter’s team. As a league we are gearing up for hosting the Allstar Tournament for the District starting next week. There is a lot of coordination and man hours that go into hosting a tournament for seven leagues. 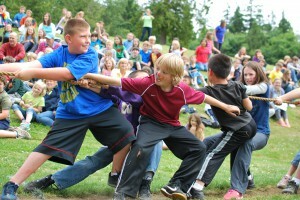 Tug-o-War at Blakely Elementary on Bainbridge. An end of the school year tradition. And the Rotary Auction is next week. It is always good to be around for Rotary. We are purging a bit and getting ready for “drop off,” which starts tomorrow. The actual auction is next Saturday, June 30th. 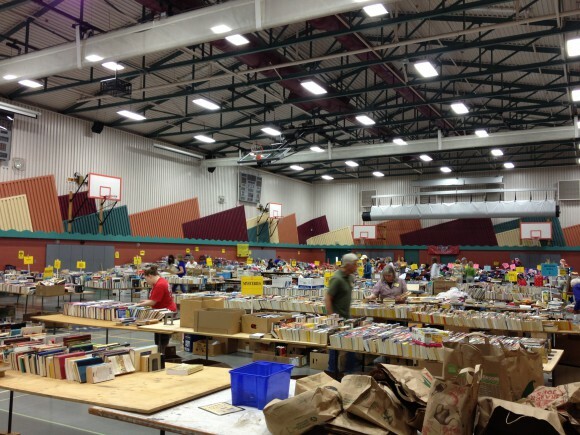 Rotary is a HUGE rummage sale that takes over our entire middle school campus – inside and out. From cars and boats to books . . . to massive literally tons of clothing, the sale is a right of passage, an institution on Bainbridge and I would be bummed to miss it. People come from miles away to shop. Parking is crazy we are always so glad we can walk. The new Studio. More to come on the new space. . .
And the reason we are purging for Rotary is we are moving. No not moving houses, but moving rooms. Last year a house we REALLY liked came one the market and we really wanted to buy it, but the market was slow, it was December, and we did not want to buy it before we sold our house. But, the house we liked sold within days and it did inspire us to get our house ready to sell (meaning we finished up a lot of projects). And we almost did – put that ‘For Sale’ sign up out front. But then we realized we really like where we live . . . really like being in town. So, we decide to stay put but make a few changes (meaning start a few NEW projects). 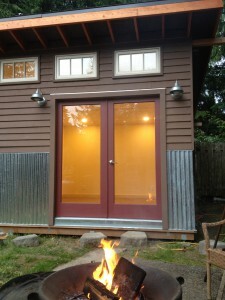 One projects was building a studio/shed in the backyard for office space. By moving our office to the new studio we gained a small “bonus” room in our remote 4th bedroom. So, we are shifting rooms, moving couches and getting a few new pieces of furniture. Oh, and purging a bit too. 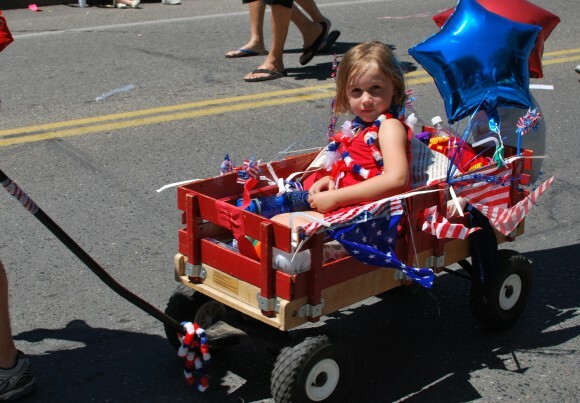 And right around the corner is our Grand ole’ Fourth of July Parade. One of the best events on Bainbridge. We always make sure to be around for the parade. This will be the sixth year one of my kiddos has been in the parade. A very fun, small town event. Who doesn’t love a parade, dunk tanks, huge ice cream sandwiches or root beer floats? Stay tuned for more about our new studio/office, Allstars, the Rotary Auction and the 4th of July hoopla. 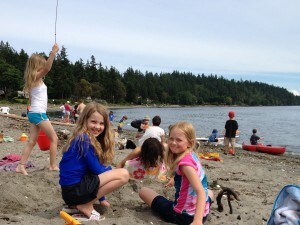 Why in the world would you want to leave Bainbridge Islnad in the summer? I wanted to share some information about my great new listing out near Battle Point Park. 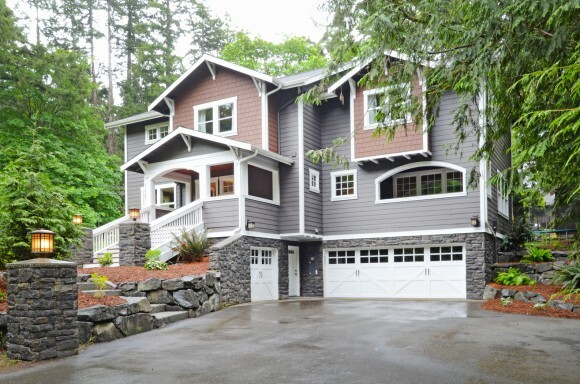 This is a custom built home with finishes far superior to anything else in this price range. For all of my listings I build a specific website that gives much more detail than the basic NWMLS limited blurb, and I also add information about the neighborhood – in this case the Battle Point Neighborhood. 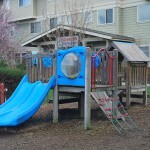 Below are the basics on the house, but do check out to the site for many more photos and details.